SAN JOSE, May 5 2015 (IPS) - Costa Rica has almost reached its goal of an energy mix based solely on renewable sources, harnessing solar, wind and geothermal power, as well as the energy of the country’s rivers. In April, the state electricity company, ICE, announced that in 2015, 97 percent of the country’s energy supply would come from clean sources. “The country as such, along with its energy and environmental policies, has decided that it wants its energy development to be based on renewable sources,” Javier Orozco, the head of ICE’s System Expansion Process, told Tierramérica. The country’s energy supply is based almost totally on clean sources. In March ICE announced that in the first 75 days of the year, not a single litre of oil nor kilo of coal were burnt to generate electricity in the country. “In our country, we build thermal plants to keep them turned off. Our aim is to have thermal plants that are turned off most of the time,” Orozco said. That objective is not always met, principally because hydroelectric power varies with seasonal stream flows. The year 2014 was dry and the country’s fossil fuel use hit a record level, generating 10.3 percent of the total electricity supply. Since the mid-20th century, Costa Rica’s energy mix has been largely based on hydroelectricity. But the country has gradually reduced its dependence on that energy source, and in 2014 hydropower accounted for only 63 percent of the total demand of 2,800 MW, while geothermal energy supplied 15 percent and wind power seven percent. Last year’s large petroleum bill was caused by the El Niño/Southern Oscillation, a cyclical climate phenomenon that affects weather patterns around the world, which hit Central America hard and triggered one of the worst droughts in over half a century. 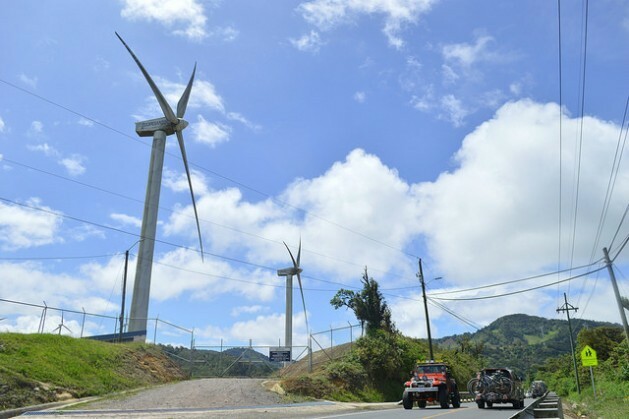 Projections of the future impact of climate change play a double role: while the world has to seek cleaner sources of energy to curb global warming, Costa Rica must diversify its energy mix because of the changes in hydrological patterns. The country is thus exploring the limits of renewable energies and the possibility of generating 100 percent clean energy is on the table, as part of a strategy based especially on geothermal power. This source of energy is hidden under the volcanoes of northwest Costa Rica. Local scientists and engineers are perfecting the technique of using the earth’s heat to generate electricity. “We are planning the construction of the new geothermal plant, Pailas II, and we are at the stage of feasibility studies for a new field. Geothermal power is important because it isn’t subject to climate change, but is constant,” Orozco explained. The plant will have 50 MW of installed capacity and it will join the ones already in operation: Pailas (35 MW), and Miralles (165 MW). That means that only 23 percent of the country’s geothermal potential of 865 MW is being used, according to ICE figures. But the problem with respect to developing this source of energy is that the rest of the potential lies in national parks, where exploiting it is banned by law. That raises the question of what definition of green energy the country will accept. Experts like former minister of environment and energy René Castro (2011-2014) see the development of geothermal energy as viable. The other measure proposed by Castro is “to authorise the private sector to generate electricity with biomass from pineapple or banana plant waste, or sawdust,” and later sell it to ICE, which administers the energy supply and is the biggest producer of electricity. Private operators represent 14.5 percent of total energy generation and one-fourth of installed capacity. But they face legal restrictions when it comes to expanding their share. The investment needed would be similar to what is projected by ICE, which is close to one percent of GDP, the former minister said. “What would change is that instead of one single investor, ICE, it would be the dominant one, accompanied by around 30 other companies and cooperatives,” he said. The country is in urgent need of holding this debate. In July 2014, the legislature approved a loan from the European Investment Bank and the Japan International Cooperation Agency to build the Pailas II geothermal project. ICE is building plants that will expand its current installed capacity of 2,800 MW by an additional 800 MW. At the same time, the government is holding a national dialogue on electrical energy, to discuss these issues, and a national dialogue on transportation and fuels, which will address the hurdle to Costa Rica’s dream of green energy: the fuel used in transportation. “The transportation sector is the biggest energy consumer at a national level and is responsible for 67 percent of the country’s total greenhouse gas emissions,” said the current minister of environment and energy, Édgar Gutiérrez, at the start of the national dialogue talks. That is why “addressing the challenges in this sector is a priority” for the government, he said. No matter how clean Costa Rica’s energy mix becomes, the country will still produce emissions and will still have a “dirty” development model because of land transport. One possible solution could come from Costa Rican-born scientist and former astronaut Franklin Chang, who is working on a hydrogen-based renewable energy system. From his laboratory in Guancaste, in western Costa Rica on the Pacific Ocean, Chang has partnered with Costa Rica’s state oil refinery, RECOPE, to create a pilot plan with several hydrogen-fueled vehicles, and has reached the test stage. But a technicality has stalled the 2.3 million dollar project. In October, his company, Ad Astra, announced that it was ready to launch the final phase. The legislature is currently studying a solution to enable RECOPE to invest in clean energy sources, but until then the project will be stalled. Congratulations to Costa Rica for showing the rest of us how to wean itself from dirty, polluting and non-sustainable fuels. I say this as a Canadian who is increasingly disillusioned living in a nation with the wealth and means to help lead the way out of the poverty of non-renewables, but remains locked into the capitalist chase for profits over anything else. Of course, thanks to our politicians who pander first to the wants of foreign-owned industry, we remain hewers of a diminishing supply of wood and carriers of an increasing volume of polluted water. I encourage you to google Alberta Jim Prentice Conservative to get a better understanding of the mess so-called developed nations are in thanks to a political reliance on dirty, unsustainable energy economics. Very impressive, but 97% of electricity supply not energy supply. Energy supply would include transportation fuel (mainly petroleum based) which dwarfs electricity.